This article first appeared in The Edge Financial Daily, on April 10, 2018. KUALA LUMPUR: Serba Dinamik Holdings Bhd is confident it can mitigate the impact of a resurgent ringgit on its earnings this year. Yesterday, the local currency was trading at 3.8690 to the US Dollar, having strengthened 3.74% since the year began. One year ago, the ringgit was trading at 4.4605 to the greenback. That would be a concern for Serba Dinamik shareholders as the group counted 64% of its revenue in the financial year ended Dec 31, 2016 (FY16) from international markets. Every 1% change in the exchange rate impacts Serba Dinamik’s net profit by 0.8%, UOB Kay Hian estimated in a March 15 note. Group managing director and chief executive officer (CEO) Datuk Dr Mohd Abdul Karim Abdullah acknowledged the risk but said the group could still grow its top line and bottom line this year, pointing to its aggressive expansion into new markets to grow earnings. “For example, we are now in Africa and revenue will start coming in soon. We are also pushing quite aggressively in Central Asia, so these [additional incomes] will partly mitigate the forex (foreign exchange) impact,” he said in a brief conversation with The Edge Financial Daily last week. The geographical diversification would also lessen risk in some markets such as the Middle East, where geopolitical risk is always a potential concern. As at FY16, 36% of Serba Dinamik’s audited turnover came from Malaysia, with Qatar — where a regional diplomatic row has cast uncertainty on businesses — the second-largest market with 18.5%. Saudi Arabia, Bahrain and the United Arab Emirates collectively accounted for another 30.2% of revenue that year, according to Bloomberg data. He also noted that Serba Dinamik’s overseas operations have a natural hedge — both revenue and cost are mainly in US dollars. That would mean profit margins would stay largely intact despite distortions in the figures due to forex movements. To recap, Serba Dinamik clinched its maiden venture into Africa last October via a 25:75 partnership to set up a chlor-alkali plant in Tanzania. As part of the joint venture, Serba Dinamik will also participate in the engineering, procurement, construction and commissioning (EPCC) works worth RM295.26 million. Ground-breaking for the chlor-alkali plant is slated for mid-April, said Abdul Karim. The group is also actively bidding for opportunities in Central Asia, with 10 proposals collectively worth US$5 billion (RM19.35 billion). Abdul Karim indicated that the group’s historical success rate is about 50%. The rapid expansion pace has supported its share price performance. Its share price had risen as much as 144%, to RM3.66 on Feb 28, from its listing price of RM1.50. However, last week the stock dropped 15.3% over five consecutive trading days as talks of a trade war shook markets. Yesterday, the stock ended higher for the first time in six trading days, up 4.17% or 12 sen to close at RM3.00, giving it a market capitalisation of RM4.41 billion. The emerging question is whether Serba Dinamik can sustain its rapid expansion pace since being listed on Feb 8, 2017. Since being listed, its outstanding order book has grown to RM6 billion from RM3.6 billion. It is targeting RM7.5 billion for 2018. Apart from EPCC and operations and maintenance (O&M) works, the group has also gone into power production, water treatment, as well as an industrial park project in Pengerang, Johor. The strain is beginning to show. Its unaudited financial statements for FY17 indicated that the group increased its cash position by RM114.74 million — thanks to the listing proceeds of RM407.1 million. 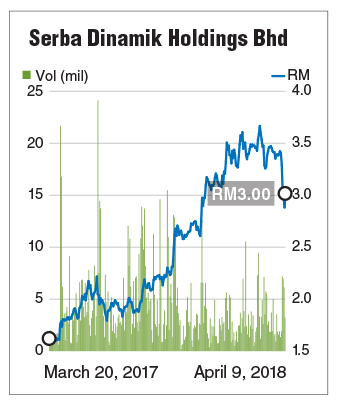 On Jan 9, Serba Dinamik proposed a rights issue to raise up to RM433.88 million by issuing as much as 133.5 million shares or 10% of outstanding shares. Proceeds would be used for its Pengerang development and as working capital for its Tanzanian project, it said. An analyst who declined to be identified told The Edge Financial Daily that Serba Dinamik needs heavy working capital and would need to manage this area delicately to avoid being overstretched down the road. A UOB Kay Hian report dated March 15 said EPCC jobs require high capital upfront compared to O&M jobs. From its RM6 billion outstanding order book, a third comprises EPCC contracts, the report noted. A possible dilemma would be that cash calls would dilute minority shareholders’ stakes. While borrowings may avoid that situation, higher interest payments would cut into earnings which may lead to lower dividends. Serba Dinamik has a dividend policy of paying out at least 30% of net profits. When asked about concerns over the need for funding, Abdul Karim said Serba Dinamik remains on strong footing. This year, the focus is on executing projects in hand, he said. He added that the group has room to borrow funds if necessary and will find a balance between equity expansion and gearing up. The group had RM604.86 million in short-term borrowings as at Dec 31, 2017. Coupled with long-term borrowings of RM84.73 million offset against RM293.2 million cash, its net gearing stood at 0.28 times. “So there is still a lot of room that we can utilise. The guideline we have put internally is that gearing should not exceed 2.0 times, but we would like to stay between 1.0 to 1.5 times,” he says.